Perfect for your little farmer for barn yard inspired nursery or playroom. In partnership with Gingiber by Stacie Bloomfield to bring you barn yard animal wall sticker decals to decorate your child's favorite room. 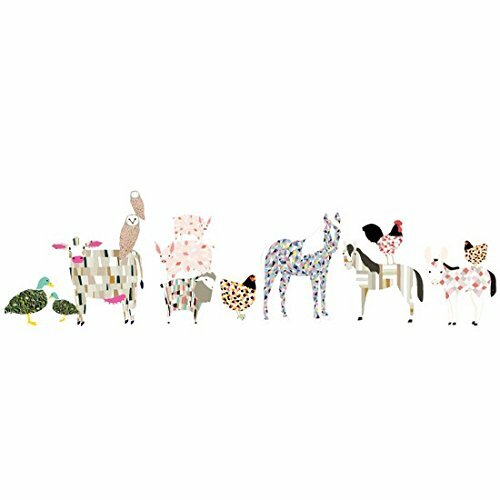 Features: 18 chic fabric stickers included: 1 donkey, 2 horses, 1 goat, 1 cow, 2 chickens, 1 rooster, 6 ducks, 2 pigs, and 2 owls. Approx height range: 4'' (smallest white duck) - 17'' (largest horse) . Please note: perfection in the design arises from the "imperfect" nature of the line work in the art produced. 18 chic fabric stickers included: 1 donkey, 2 horses, 1 goat, 1 cow, 2 chickens, 1 rooster, 6 ducks, 2 pigs, and 2 owls. Approx height range: 4'' (smallest white duck) - 17'' (largest horse) . Please note: perfection in the design arises from the "imperfect" nature of the line work in the art produced.